94205 First Street Gold Beach OR 97444. Turn East on Highway 101 at the Chevron Station / Gold Beach Books. 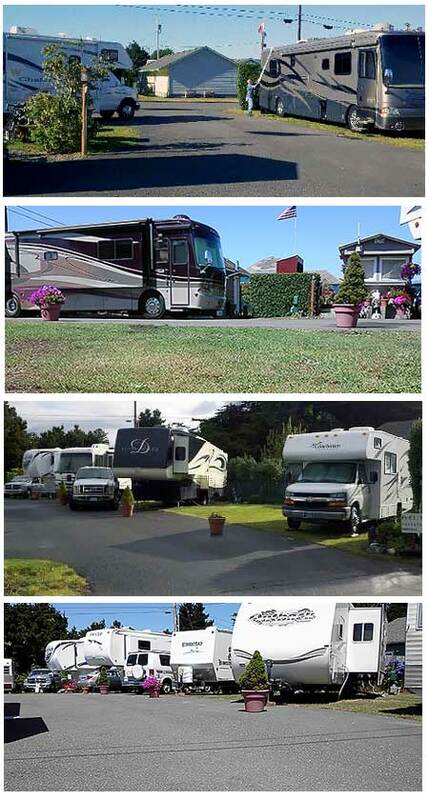 Gold Beach RV Park offers guests a nice selection of amenities. A small, quiet and clean park with hot showers. A laundromat is conveniently located approximately five minutes from the park on Highway 101. Walk to shopping, coffee shop, book store, pizza, restaurants, town park, beaches, trails, art and more. All beaches are close. Fish or take a jet boat ride up the Rogue River. We offer 20, 30 & 50 amp service. FULL HOOKUP includes water, sewer, electric, trash, free 30 Mbps hi speed WiFi service. You’ll find 20 back-in sites & 2 pull-through sites. Give us a call to let us know what works best for your rig and we will find the site which best suits your needs…! **Monthly tenants pay for electric. Each site is metered. All of the above at a great price! Check In Time: Between 11 am & 5 pm daily. If you require a later arrival, please call in advance to make those arrangements. Maximum 2 Pets. Owners please clean up after your pets. No aggressive or barking dogs allowed. Be considerate to your neighbors. You will be asked to leave if these rules are not followed. Cancellations – You will be charged for a one night stay if not notified within 24 hours of your arrival date. Please give us a call at 541-247-0709…!